Mail us your MacBook and one of our Certified technicians can repair it for you! We have performed many Macbook repairs have most repair parts in stock! Our turn around time on these models is 1-2 business days! We are very confident in our work and becasuse of that we offer a whole 12 month warranty on our repairs! Start you MacBook Retina 12 repair today! Ready to fix your MacBook 12 inch Retina problems? “Add to cart” the repair you need to initiate checkout. We can accept credit cards through Authorize.net or PayPal. We have many different options you can choose to have your laptop shipped to and from our warehouse. You can package your laptop and mail it to us yourself , or if you want, we can send you a prepaid label. We can even send you a safe shipping box so you don't have to go out and find one that will fit your laptop! Need help with checking out? 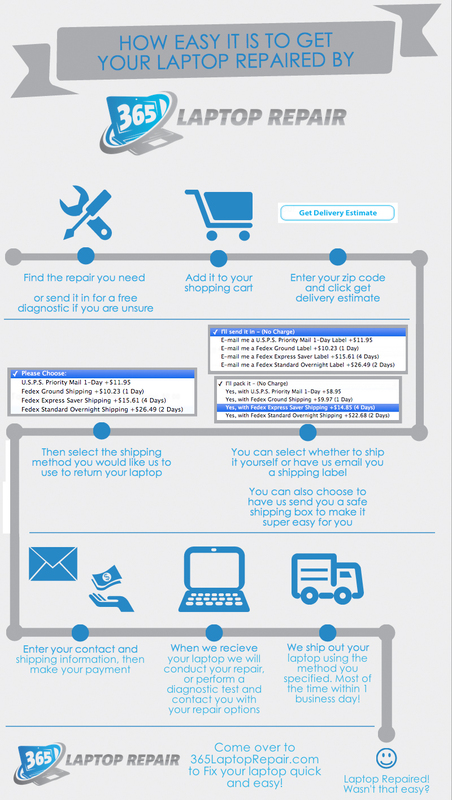 Checkout our new infographic that shows how easy it is to have your laptop fixed through 365 Laptop Repair. Contact us about our repair services! Do not hesitate to get in touch with us with any inquiries about our services by clicking the button below! Interested in doing a screen repair yourself? Check out our 12 Inch screen replacement part page and our 12 Inch screen assembly replacement part for the part you need to do this repair yourself. Don't know the reason your MacBook isn't working? Mail it in to use and we will check it out for you! Once we recieve your laptop we will inform your of its arrival and then perform a full diagnostic test. We will then let you know what the problem is and what the best option for repair is. In the event that we end up carrying out a repair on your computer, this service is free! Should you make the choice to not to have a repair performed by us is a $49 diagnostic fee. If you know the repair that you need and don’t see it here or perhaps you prefer to contact us about specifics, you may use our Repair Estimate Page to get a Free Repair Quotation. 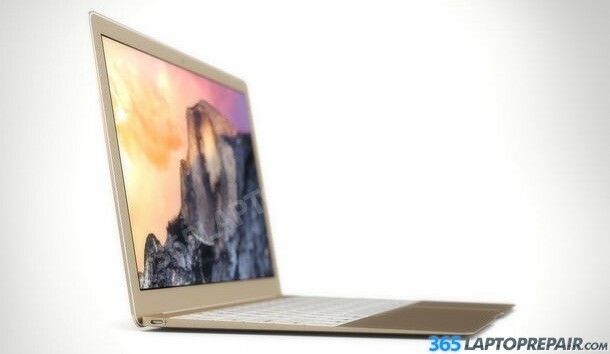 The repair we provide for damaged screens is a MacBook Retina 12 glass and LCD repair only. In this repair we change only the glass and LCD while reusing the old back casing. We recently got access to the complete screen assemblies for this model and they are available for purchase. Please let us know in which color you need your assembly if you choose to order the part only from us. They are Silver, Gold or Grey colored. Unlike many other repair shops, the screens we use for our service are in brand new condition. For our Retina 12 replacement service we provide a 12 month warranty on the parts and the repair service. It includes a zero dead pixel policy! Interested in doing the repair yourself? Check out our Screen Replacement Parts page for our repair tutorials, parts guides and part only pricing! Buy the LCD screen part and replace it yourself here! Buy the LCD screen assembly part and replace it yourself here! Contact Us if you have questions about any of our services! Brand new and with the upgraded faster UJ272 Panasonic/Matshita Blu-Ray recorder drive! Solid aluminum enclosure and high-speed USB 3.0 cable plus USB-C connection for your Macbook Retina 12” laptop. 6 months warranty! Instant no driver setup on both Mac and PC. This drive will also read and burn CD and DVD disks.